I mean, common, is it so hard to figure out? 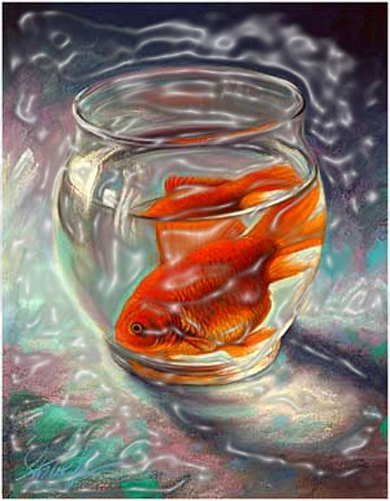 A goldfish imprisoned in a jar is the saddest thing in the world! Why do I want to exhibit it in my exhilarating colorful Norooz table? By the same token, Norooz itself is much more than a celebration of Persian New Year; it is the celebration of nature, of the re birth, and rejuvenation, of hope and wealth, health, beauty, purity and happiness that comes with it. It does not take a rocket scientist to figure a captive goldfish does not belong there! And I am not even talking about the miserable conditions that the poor thing is industrially farmed before being sold; the conditions that it is being kept during its short life at hands of curious children, examining it every so often, etc. According to online campaigners, each year five million goldfish are killed around Norooz. FIVE Million only in Iran. That’s too depressing. No, I would say, keeping goldfish is not refreshing on any happy Noroozi table in any part of the world. Well, the good news is that this practice apparently does not have any Iranian connotation whatsoever! It has been argued that among dozens of centuries old travel documents and Norooz-letters and painting passed on to us, nowhere do we see any mention of goldfish being a part of Norooz, while every other part of the tradition and of the table has been described in details and spelled out. It is true that red fish generally has a special place in Persian mythology and motifs for instance in Persian rugs. Also it is true that eating stuffed fish with rice is connected with Norooz. Yet, none of these really connect Norooz table with live and captive goldfish. In fact, it seems that the tradition of goldfish is linked to a Chinese tradition imported to Iran – in a distorted fashion about a century ago: At the turn of their New Year, some of the online goldfish buyer campaigner argue, Chinese free a red fish to celebrate life. We liked the tradition, so adopted it, only we imprison and keep the goldfish! Cannot testify to the truth of this one! All I know is obtaining a goldfish for the purpose of keeping, showcasing, freeing, or whatever… is so against the spirit of the Norooz I know and grew up and cherish. And I LOVE my Norooz table just as it is- so full of life without goldfish!